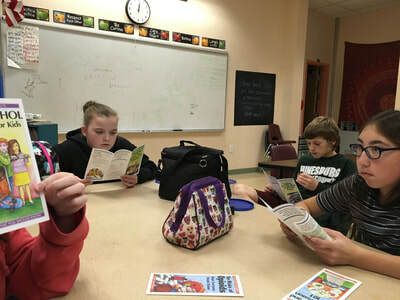 HCS CY LEAD students studying brochure samples, trying to decise which ones to order for the community. 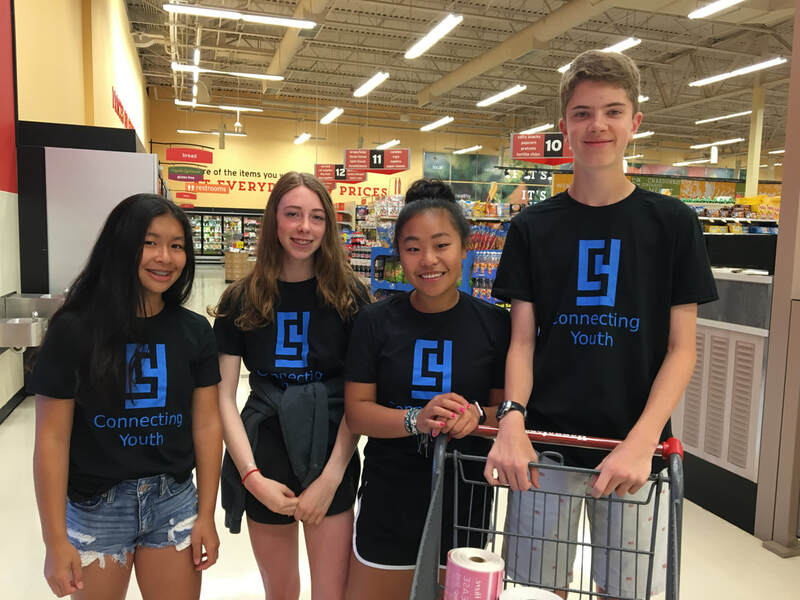 In an effort to inform adults about supplying minors with alcohol, four 9th grade members of the Champlain Valley Union High School CY LEAD (Connecting Youth Leadership Education the Anti-Drug) group conducted a Sticker Shock campaign at Hannaford's in Williston the morning of June 8, 2018. Officer Matthew Cohen from the Williston Police Department joined us in this endeavor. Sticker Shock is a county wide Campaign co-sponsored by START (Stop Teen Alcohol Risk Team) and the Chittenden Prevention Network. 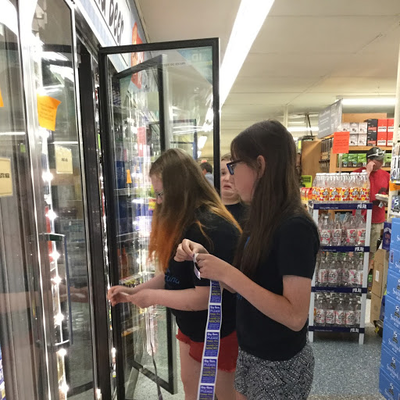 The team placed stickers and window clings on alcoholic beverages at Hannaford's. 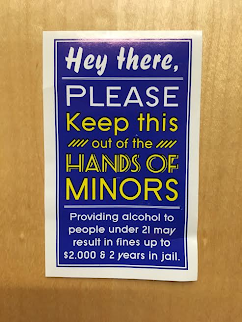 The stickers and clings share a warning message about the penalties for providing alcohol to anyone under 21. When you go to Hannaford's look for the red window clings on the beer cooler doors! As the sticker indicates, consequences include up to a $2,000 fine and/or up to 2 years in prison if convicted of furnishing alcohol to minors. Sticker Shock is meant to reduce underage drinking by limiting youth access to alcohol. The goal is to educate people 21 and over about the legal and financial consequences of providing alcohol to minors. The students loved having the opportunity to make a difference in their community and were wonderful ambassadors of CVU. 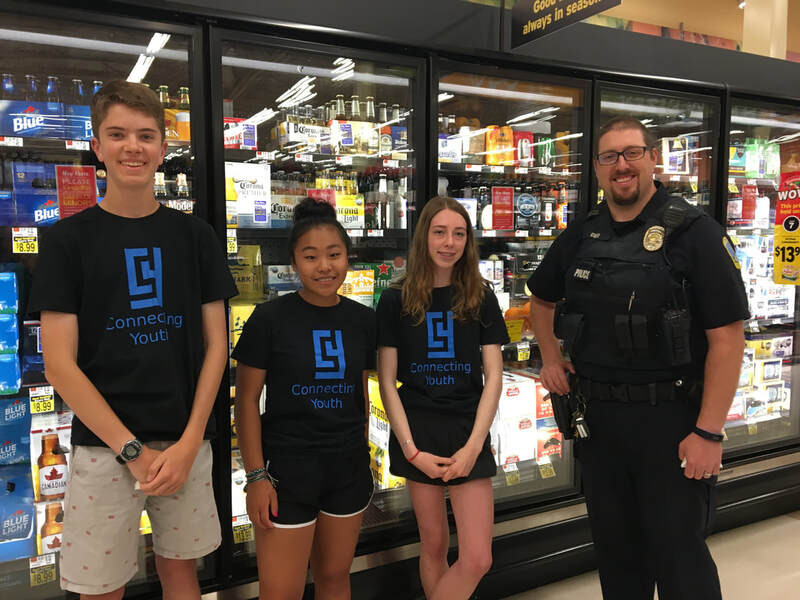 Thank you to Williston Police, Hannaford's, and CVU for a successful collaboration in helping keep our youth safe! 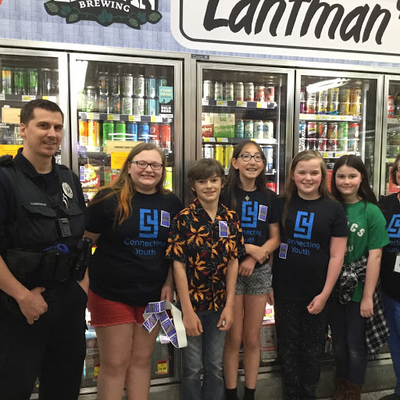 On May 17, 2018 in an effort to inform adults about supplying minors with alcohol, five 7th grade members of the HCS CY LEAD (Connecting Youth Leadership Education the Anti-Drug) group conducted a Sticker Shock campaign at Lantman's during their lunch and recess. Sticker Shock is a county wide Campaign co-sponsored by START (Stop Teen Alcohol Risk Team) and the Chittenden Prevention Network. 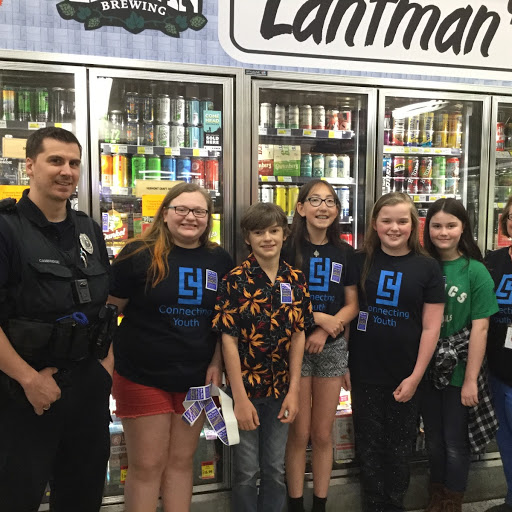 Students placed stickers and window clings on alcoholic beverages at Lantman's. The stickers and clings share a warning message about the penalties for providing alcohol to anyone under 21. When you go to Lantman's look for the red window clings on the beer cooler doors! Office Anthony Cambridge joined us in this endeavor as a member of the Hinesburg Police Department. The students loved having the opportunity to make a difference in their town, were wonderful ambassadors of HCS, and had a lot of fun too. 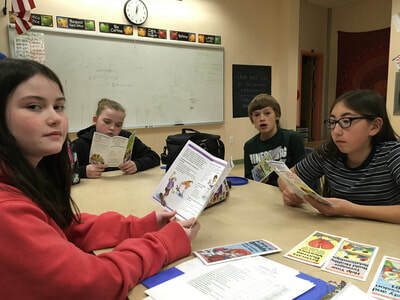 ​Hinesburg Community School is celebrating all week long with morning announcements shared by their CY LEAD students regarding Kick Butts Day. 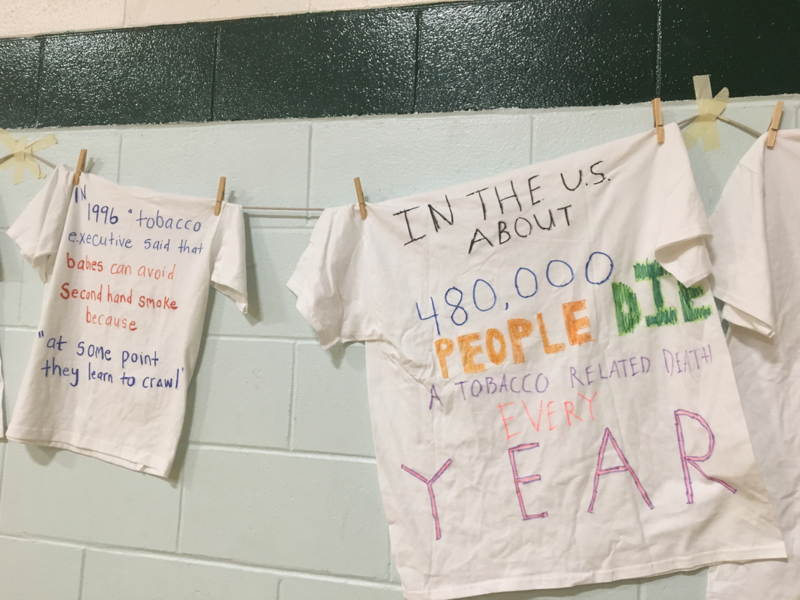 CY LEAD students have also created a display called "Airing Out Big Tobacco's Dirty Laundry" and it consists of t-shirts with facts about the tobacco industry. This display is in the gym. Want to learn more about Kick Butts Day, check out https://www.kickbuttsday.org/. The CVU CY LEAD group bring the message to their peers by posting these posters in all the CVU bathrooms the last week in October. Find out more facts about e-cigerettes, vaping, juuling etc. here. 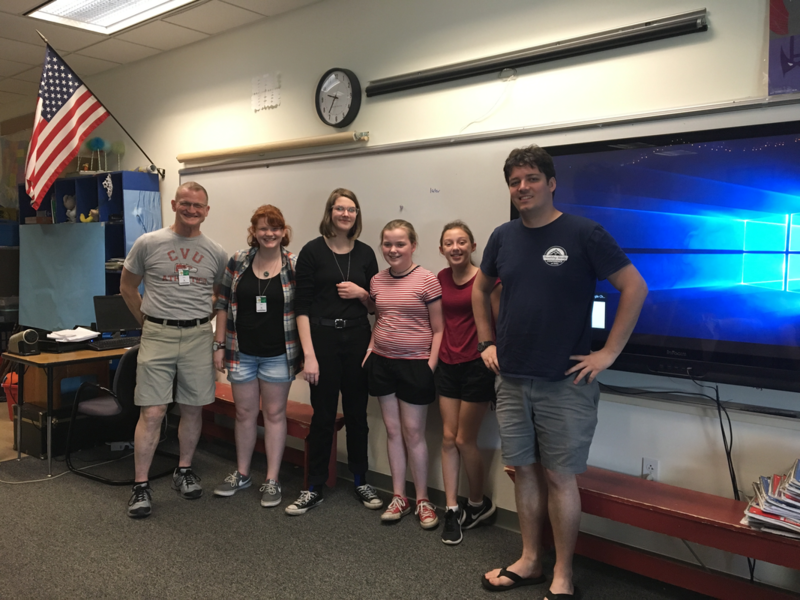 The HCS Rainbow Spirits group and representatives from the CVU GSA (Gender & Sexuality Allilance) presented information to the HCS 8th grade the morning of May 31, 2018. The presentation included information about the groups at HCS and CVU and also offered information about genders and pronouns. 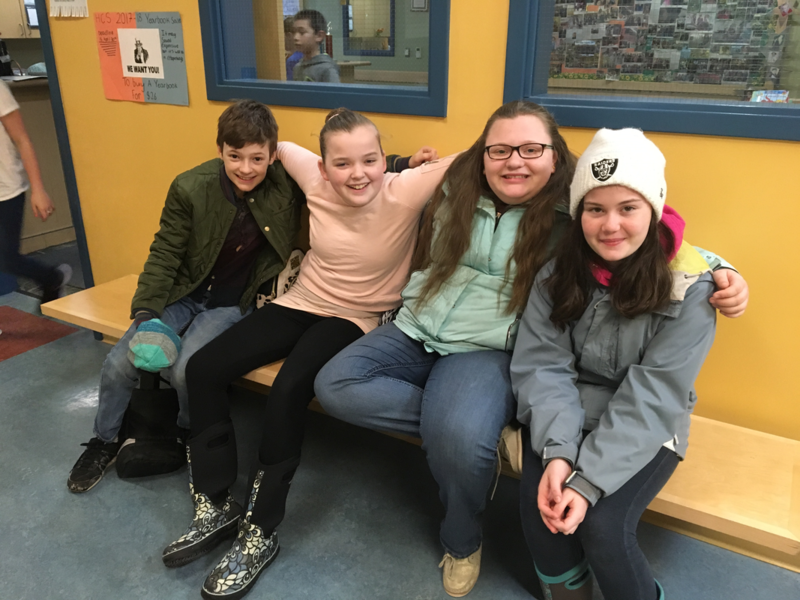 Rainbow Spirits is a group of middle school students dedicated to creating a safer and more inclusive school community for everyone, in particular LGBTQ youth. 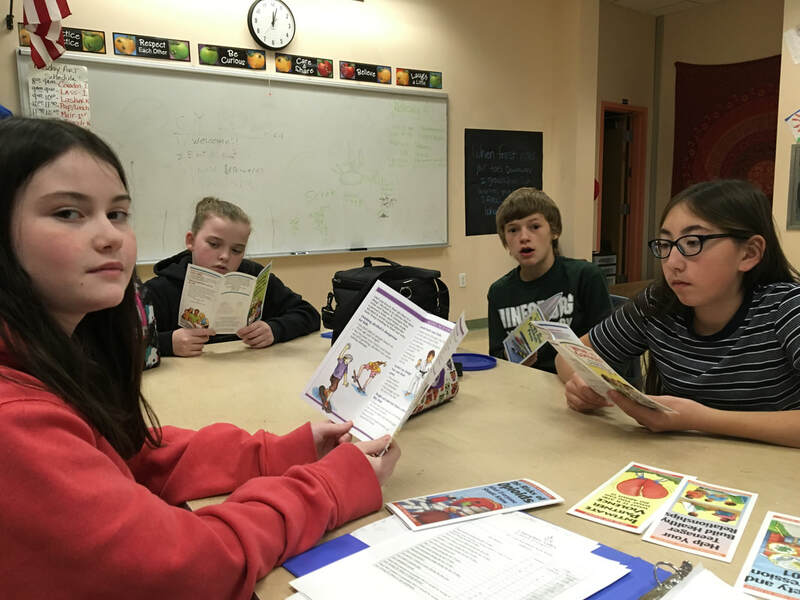 This group has presented to the 6th, 7th and 8th graders and has supported the fledgling group at the Shelburne Community School. Rainbow Spirits' mission is to educate the HCS community. They meet on Wednesdays during lunch and recess in the Maker Space with Chris Nial as the advisor. GLOW meets on Mondays during lunch and recess and is a social safe space. 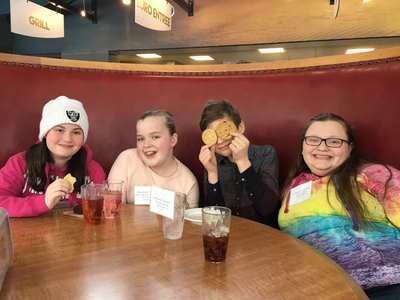 ​On Friday, March 16, 2018 four HCS 7th graders attended the VALME Beyond Bullying Conference at Champlain College. 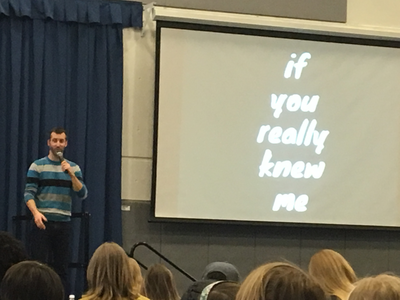 Students heard from keynote speaker Colin Ryan, a Burlington resident who tours nationally sharing his comedy and messages of kindness. Ryan asked compelling questions of the Vermont middle school students including: "What is it like to be you? What would it look like if you had unlimited courage?" He also asked students to think about inclusion and offered "Courage is standing beside the person that is standing alone." 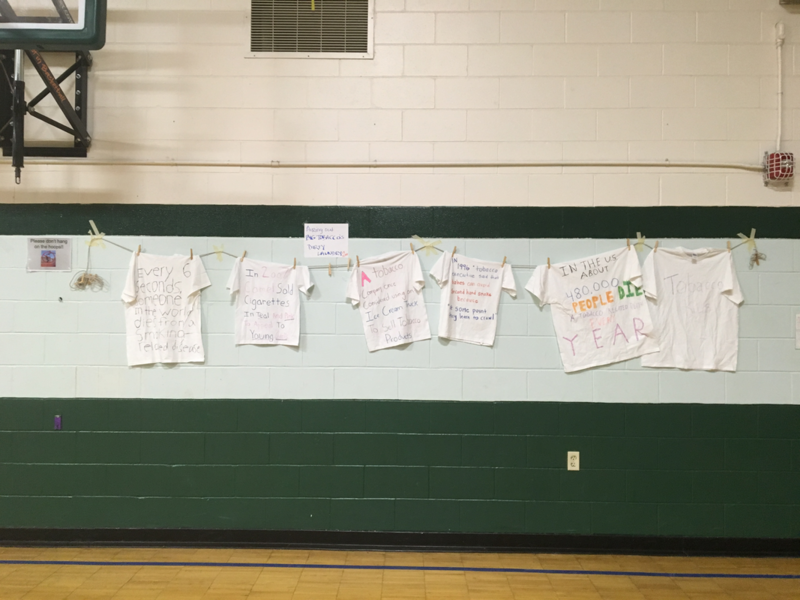 Thomas Garvelli, HCS 7th grader, said "It was a good reminder that everybody is in it together. We need to stick up for eachother sometimes." Students participated in smaller workshops as well. 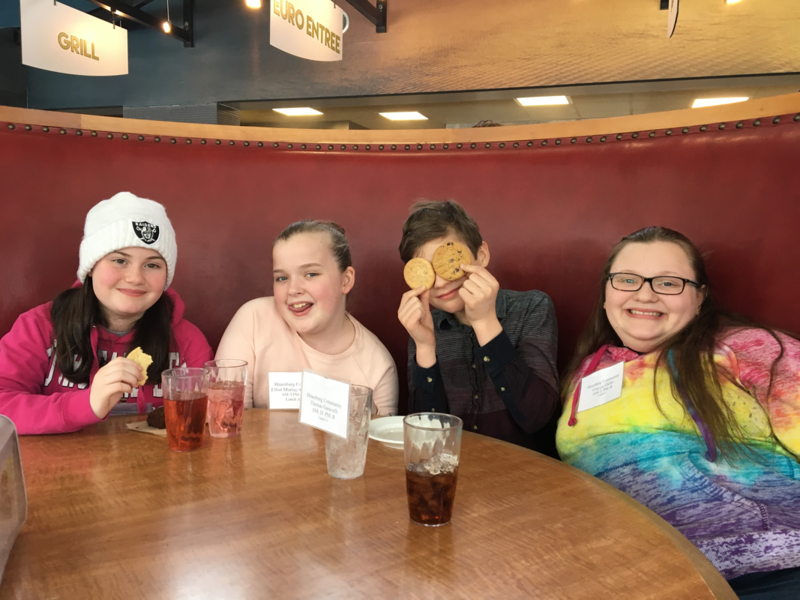 HCS students explored topics including "Team Building in Athletics" "Conversations About Race" "Exploring Identities" "Theater Games" and "Beyond the Sticker". ​In the Exploring Identities workshop students learned about various perspectives while reading a short story about an immigrant family. The Diversity Wheel was shared with this group. 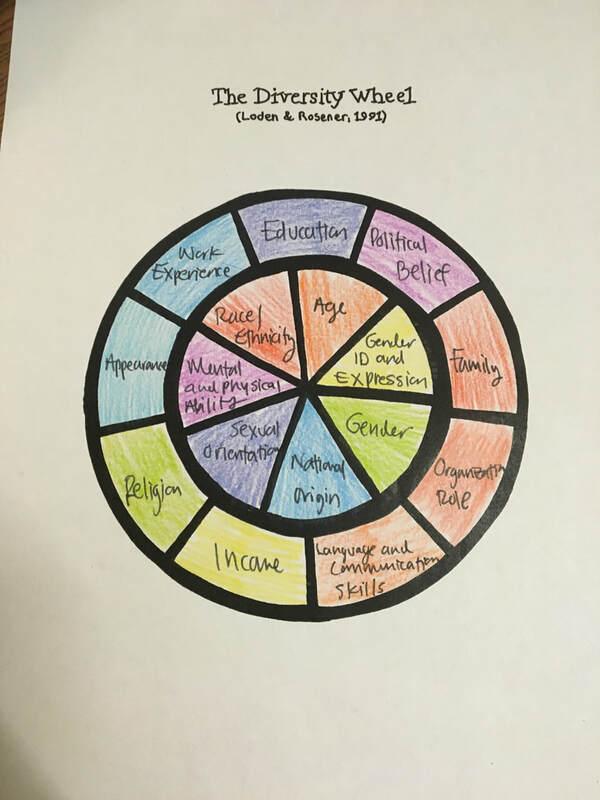 There are a variety of Diversity Wheels but the instructor shared that this was the most middle school user friendly one - as you can see in the photo on the right. Graycie Elkins said of the day at Champlain "It was something you can take a lot away from." Maddie Kittell agreed saying "It was fun and educational and boosts your confidence and awareness." These students were terrific ambassadors of HCS and did a great job jumping in and partipating in the conference! 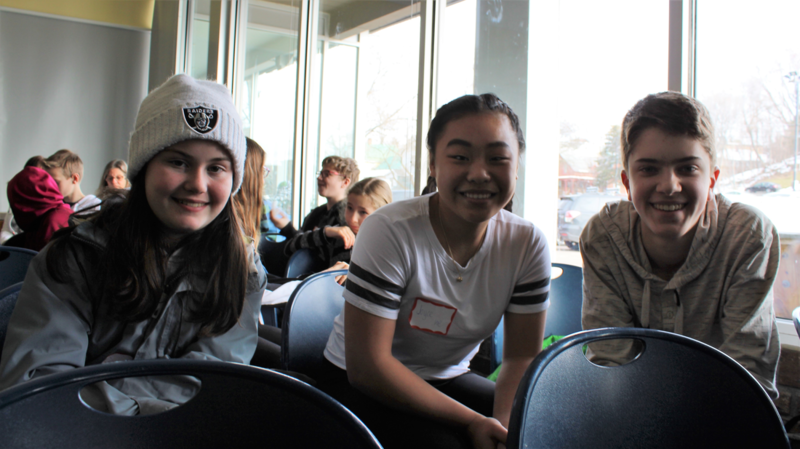 On Friday, March 23, 2018 three CVSD students participated in the Above the Influence retreat presented by Dover Youth to Youth (Dover, NH) and sponsored by CY-Connecting Youth and the Chittenden Prevention Network. Students learned about lies in alcohol and tobacco advertising and public speaking and speaking to the press.